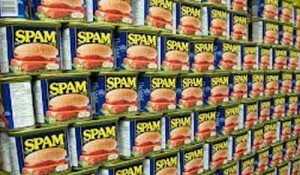 I have a spam problem. I really like my blog–or rather, my collection of articles. (“Blog” implies something that is regularly updated — and that just isn’t going to happen, so I don’t typically call this a blog. More here.) When a client or colleague has a question, I typically turn that into a post. Then when someone else asks me the same question (this happens all the time), I can send them the link to the post. Nice. Efficient. Everyone’s happy. When I get a real comment or question from a reader, I happily respond and do what I can to give a good answer and provide additional information. I get about 10-20 comments every day. The thing is, 99.8% of those comments are from bots or from people posting bogus comments (often hilariously poorly-worded) just so there will be a link on my blog to their site. The folks at SEOBook have a nice infographic explaining what this type of spam is — a good introduction to this issue. Blogger Derek Powazek has a very informative article about the blog-spamming issue and how it works. But understanding a problem doesn’t make it go away. I do not promote this blog other than using it as a shortcut way to answer client’s questions. Maybe I should, but I don’t. I don’t have ads here. I don’t monetize this in any way. In short: this blog does not contribute to my income. It’s not my job — I need to focus on billable work for my clients. I just can’t spend any more time throwing out the spam comments. (I know, I could just ignore them and let them accumulate in my WordPress dashboard — but that would be so untidy!). So I am closing it down. No more comments. But I want to hear from you! If anyone reading the articles on my blog have any comments or questions — I mean REAL comments or questions, not a sales pitch for an almost real-looking Rolex watch — then I want to hear from you! How do you reach me? You’ll see a little ad/link for my company Miller & Mattson on the right side of this and every page in my blog. Click that, go to the “About & Contact” page — and there’s a link to send me an email. I’m a hopelessly email-centric person tethered by my iPad, iPhone, or computer to a constant stream of emails. This is how I communicate. I’ll answer your email pretty fast. Really. So goodbye comment spam. I won’t miss you. I’m shutting you down and reclaiming a weekly hour or two of my life back. I’m afraid the only moral to this one is that letting spammers clog your blog with bogus comments only rewards their very bad behavior. Not only should you never allow that, you should also NEVER buy anything from these people. Their activities cost businesses millions of dollars every year in lost productivity. And every time you miss an important email because it was caught by your spam filter — you can blame this on the spammers who have made spam filters necessary in the first place.